Shallot is the common name for an edible, bulbous, herbaceous plant, which is related to the onion (Allium cepa), but has a cluster of small bulbs attached at a common base rather than a single large bulb. Plants known as shallots are variously classified as a variety of onion, Allium cepa var. aggregatum, or as a separate species, A. ascalonicum, with such apparent synonyms used as A. cepa ascalonicum, A. cepa aggregatum Group, and A. escalonium. Another common name is multipler onion. While potato onion also is used as a common name, it generally is seen as a particular variety of shallot with larger bulbs. Shallot also is the term for the edible bulb of these plants. However, the term shallot also is used for other plants. The French gray shallot or griselle, which has been considered to be the "true shallot" by some, is Allium oschaninii, a species that grows wild from Central to Southwest Asia. Furthermore, in some countries the term shallot is used in reference to spring or green onions (A. cepa), which are harvested while immature and commonly known as scallions, while shallots are referred to by alternative names such as eschallot or eschalotte. The shallot offers unique culinary options. Its mild onion flavor, combined with its unique aroma, texture, and form, makes it a favorite for diverse dishes, whether its bulbs and leaves are cooked as a vegetable, added to salads, pickled, used as a flavoring in soup, or eaten raw. Even the shallot flowers can be used as a garnish. Shallots are variously placed in the flowering plant family Alliaceae or Liliaceae. Alliaceae, a family of herbaceous plants, are monocots and part of the order Asparagales. The family has been widely but not universally recognized; in the past, the plants involved were often treated as belonging to the family Liliaceae—and still are by some botanists. The Liliaceae, or the lily family, is a family of monocots in the order Liliales. Plants in this family have linear leaves, mostly with parallel veins, and flower parts in threes. The lily family traditionally was a paraphyletic "catch-all" group that included a great number of genera that are now included in other families, such as those now placed in Alliaceae. Allium is the onion genus, with about 1250 species, making it one of the largest plant genera in the world. They are bulbous plants that produce chemical compounds (mostly cystein sulfoxide) that give them a characteristic onion or garlic taste and odor, and many are used as food plants. The flowers form an umbel at the top of a leafless stalk. The bulbs vary in size between species, from very small (around two to three millimeters in diameter) to rather big (eight to ten centimeters, three to four inches). Members of the genus include many valued vegetables such as onions, shallots, leeks and herbs such as garlic and chives. A strong "onion-like" odor is characteristic of the whole genus, but not all members are equally flavorful. The shallot, or Allium cepa var. aggregatum, or A. ascalonicum, tastes a bit like an onion, but is less pungent and with a sweeter, milder flavor (Bender and Bender 2005). Unlike onions, where each plant normally forms a single bulb, shallots form clusters of offsets or bulbs, each covered by a thin, papery skin. When one removes the papery skin from the head of a shallot, one finds multiple cloves (often two or three) rather in the manner of garlic. The plant may grow to 0.3 meters (12 inches) (PFAF 2008a), with the potato onion variety growing to 1.2 meters (four feet). The flowers form as an umbel and have both male and female organs. They are insect pollinated. The leaves are small and hollow. Shallots are perennial plants. The name ascalonicum, used for the species name Allium ascalonicum, comes from Ascalon, the ancient Palestinian city where the shallot is believed to have originated (Herbst 2001). Allium oschaninii, the French Gray shallot, has a long bulb, covered with gray skin. A. ascalonicum has a rounder bulb and the papery skin may vary from pale gray to pale brown to rose, with the off-white flesh tinged with green or purple (Herbst 2001). 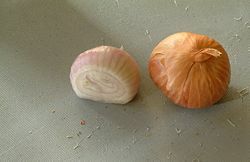 Two main types of A. ascalonicum are the Jersey or "false shallot" and the more subtly flavored "true" shallot, with the Jersey shallot the larger of the two (Herbst 2001). There are many cultivars of A. ascalonicum, such as "Giant Red," which have a mild, spicy flavor and are excellent raw in salads (PFAF 2008a). In Australia, the foodstuff industry has renamed a number of vegetables. The name shallot has been applied to scallions, normally called spring onions in Australia, and shallots have been renamed eschalotte. The term French shallot has also been used for Allium oschaninii. The leaves, bulb, and flowers are all edible, with the bulbs and leaves the main part consumed. The bulbs and leaves may be eaten raw or cooked. The bulbs can be added to salads, cooked as a vegetable, or used as a flavoring in soups. The leaves typically are not harvested in quantity because they can reduce bulb production. The raw flowers can be used as a garnish on salads, but are somewhat dry (PFAF 2008a). Shallots for sale in Southern France. Onion and shallot output in 2005. Similar to onions, raw shallots release chemicals that irritate the eye when sliced, resulting in tears. See onion for a discussion of this phenomenon. Shallots are particularly high in anti-cancer compounds (Lang 2004). The shallot in Persian is called موسیر (Moo-Seer), which is often crushed into yogurt. Iranians enjoy yogurt in this way, especially in restaurants and Kebbab-Saras where just kebabs are served. Most shallots are grown wild, harvested, sliced, dried, and sold at markets. Buyers will often soak the shallots for a number of days then boil them to get a milder flavor. Shallots are called 'bawang merah kecil' (small red onions) in Bahasa Melayu, an official language of Indonesia, Malaysia, Brunei, and Singapore, and "hom" (หอม—literally "fragrant") in Thai. In South East Asian cuisines, such as Thai, Malaysian, and Indonesian cuisines, both shallot and garlic ('bawang putih', white onions) are very often used as elementary spices. Raw shallot can also accompany cucumbers when pickled in mild vinegar solution. It is also often chopped finely, then fried until golden brown, resulting in tiny crispy shallot chips called bawang goreng (fried onions) in Indonesian language, which can be bought ready-made from groceries and supermarkets. Shallot enhances the flavor of many South East Asian dishes, such as fried rice variants. In Indonesia, shallot is sometimes made into pickle, which is usually added in variable kinds of traditional food. Its sourness increases one's appetite. It is widely used in the southern part of India. It is called Sambar Vengayam in Tamil and Kochulli in Malayalam and is used in Sambar (a type of curry) and different types of kuzhambu(curry). Germplasm Resources Information Network (GRIN). 2008a. Allium cepa L. var. aggregatum G. Don. USDA, ARS, National Genetic Resources Program. Germplasm Resources Information Network. Retrieved May 13, 2008. Germplasm Resources Information Network (GRIN). 2008b. Allium cepa L. USDA, ARS, National Genetic Resources Program. Germplasm Resources Information Network. Retrieved May 13, 2008. Lang, S. S. 2004. Some onion varieties can boost anti-cancer benefits, Cornell researchers say. Cornell Chronicle. Retrieved May 14, 2008. Plants For a Future (PFAF). 2008a. Allium cepa ascalonicum, common name shallot. Plants For A Future. Retrieved May 13, 2008. Plants For a Future (PFAF). 2008b. Allium cepa aggregatum, common name potato onion. Plants For A Future. Retrieved May 13, 2008. Plants For a Future (PFAF). 2008c. Allium cepa oschanininii. Plants For A Future. Retrieved May 13, 2008. This page was last modified on 11 September 2015, at 15:01.